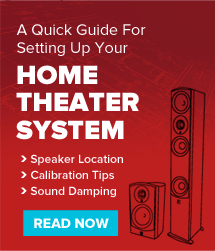 Positioning the surround speakers is crucial in order to enjoy the immersive sound that home theater is known for. But, deciding which configuration and what type of speaker to use can be daunting. The tragic fact is many people don’t even connect the surround speakers in their system, thus eliminating an integral part of the experience. Keep in mind there are several kinds of speaker designs and different surround formats, all with varying numbers of speakers and positions. Here is a brief breakdown of the most commonly used speakers for surround. These are the standard type of speakers used for surround. They’ll have the best sound outside of the tower and can be wall-mounted, ceiling-mounted, placed on stands or on existing furniture. So if you like to listen to music in multi-channel mode, a bookshelf or tower surround will be ideal. In very close proximity (i.e. less than 3ft) a less directional speaker (such as a Bipole) may be more advantageous. The satellite speaker is usually a smaller version of the bookshelf. Due to the size, it’s easier to wall-mount and is less conspicuous. You trade off a little in frequency response, but that’s usually less of an issue with the surround channels due to the nature of the audio sent there. Since the drivers fire in different directions, these types of speakers are very good at dispersing the sound. In situations where the surround speakers will be close to the listening position or where you want a more diffuse surround effect, the Bipole/Dipole is an excellent choice. However, if the distance between you and the speaker becomes too great, a more direct firing speaker is a better choice. In-wall or in-ceiling speakers can be an effective choice for when you want to minimize the visibility of your system. The more immersive formats, like Dolby Atmos, are using in-ceiling speakers in conjunction with the standard 5.1/7.1 surround setups. So it’s important to account for this as you’re planning your setup. For example, it would not be advisable to have in-ceiling rear surrounds combined with the Atmos in-ceiling channels. The tower is the least commonly used for surround channels, but that doesn’t mean you can’t! Normally used for the front L/R channels, the tower will have the fullest sound with the widest frequency response. In a surround application, they are a little more difficult to position due to their size and they can’t be elevated without some considerable engineering, but the experience of a full tower surround setup is incredible. Once you’ve determined the speaker configuration you want, then just it’s a matter of the logistics in setting them up. Of course with the larger system setups (like the 9.1.2 and above) you run into hurdles in the power and processing realm. Make sure your AVR is cable of processing the total number of channels you require. Another amplifier can always be added to power the additional channels if necessary. Be open to all possibilities for your space, as most surround speakers can be placed on stands, furniture, wall mounted or even ceiling mounted. Keeping the flow of a room while maintaining sonic integrity is often the most difficult point to juggle when setting up your speakers, so make sure to have fun and think creatively!